(shading of the horizon incl. reflective radiation). The original version of the SolRad program was developed by the Office of Applied Mathematics, Dr. Walter Heindl, in Vienna from the late 1970s to the early 1980s. Between 1990 and 2003, Tomasz Kornicki, in collaboration with Dr. Krec, created another version of the program. 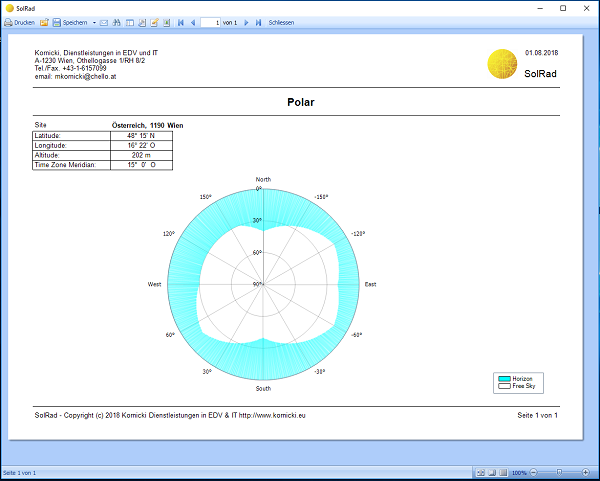 Today the company Kornicki would like to provide you with the current version SolRad 4. Saving energy is a topical issue. Sufficient thermal insulation can keep the amount of heating energy required as low as possible. Increasingly, attempts are also being made to view the incident solar radiation not only as an undesirable disturbance to the summer interior climate, but also as a source of energy in winter and especially in the transitional period, and to use it accordingly. For thermal calculations in the building industry – a very important part of building physics – it is necessary to know the intensity of direct and diffuse solar radiation on any oriented surface elements. 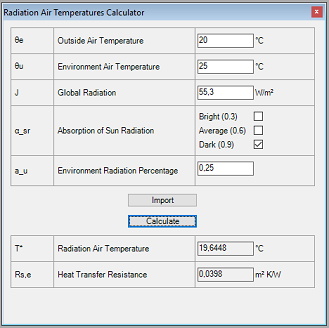 We use a system of formulas that allows the complete calculation of these solar radiation intensities only from the indication of date, time, geographical location, area orientation and few meteorological parameters. 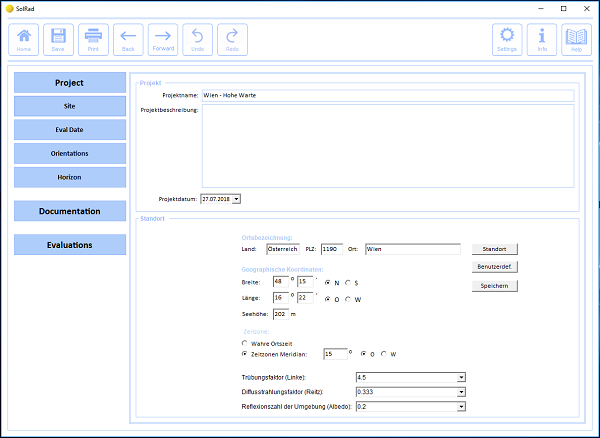 It is specially designed for heating, air-conditioning specialists, building physicists and architects. 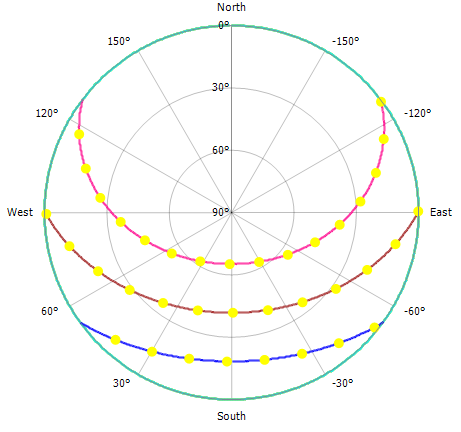 In extension of the formulas formerly used in the building physics literature, the elliptical Earth’s orbit, time difference and equation of time, the light beam curvature in the Earth’s atmosphere and any existing elevation of the horizon were taken into account. The Haziness factor (Linke) describes how direct solar radiation is attenuated when entering the Earth’s atmosphere. It depends on the geographical location of the site as well as on the weather. The Haziness factor is the number of Rayleigh atmospheres that the state of the atmosphere corresponds to; an ideal atmosphere has a Haziness factor of 1. Since the Haziness factor depends on the number of particles contained in the air, it is higher in cities and industrial areas than in areas with low pollution; it also depends on the water content of the air, which is subject to seasonal fluctuations (more water vapor in summer, less in winter). 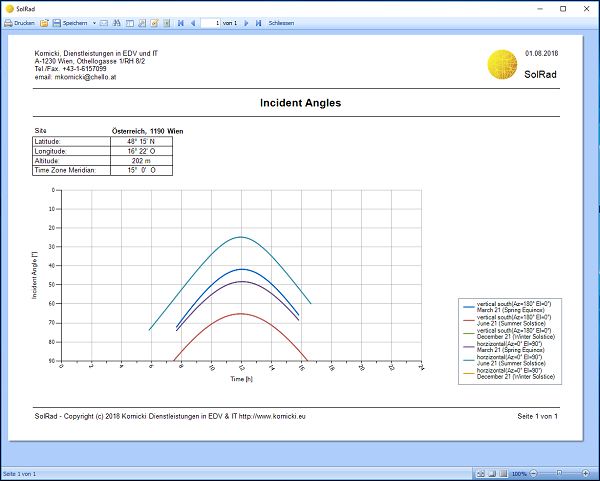 For the summer fitness test according to ÖNorm B8110-3, the Linke factor must be set to the value 4.5. 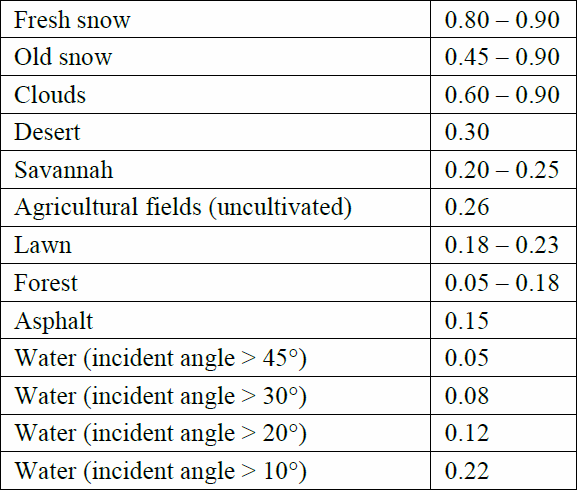 The Scatter factor (Reitz) indicates the percentage of solar radiation that is “lost” due to scattering effects in the atmosphere and reaches the earth’s surface as diffuse sky radiation. As a proportion, the value of the Reitz factor can only be between 0.0 and 1.0. With a complete sky covered with dark storm clouds, the Reitz factor can assume values below 0.1; it is almost dark. In high fog clouds, the Reitz factor can rise to over 0.8; despite a lack of direct radiation, it is very bright. 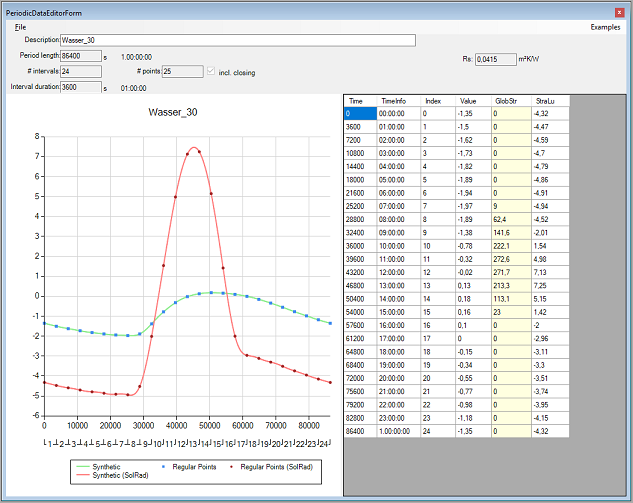 For the summer fitness test according to ÖNorm B8110-3, the Reitz factor must be set to the value 0.333. The Albedo number indicates the reflection of the global radiation. It corresponds to the ratio of reflected to incident radiation intensity or the ratio of up- and downward-directed radiation flux densities. The average Albedo of the earth is 0.3. The Albedo can have values below 0.1 on dark surfaces (e.g. 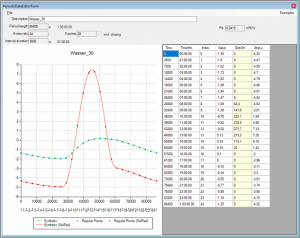 dark asphalt) and around 0.5 on light surfaces (e.g. snow conditions or desert areas with light sand). 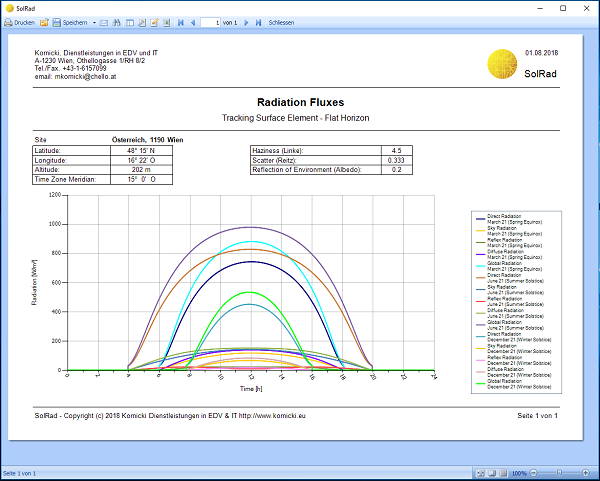 For customers of AnTherm/SolRad there is now the possibility to evaluate the influence of solar radiation and the long-wavelength radiation to and from the external surfaces of a building construction with regard to thermal transmission and temperature distribution. 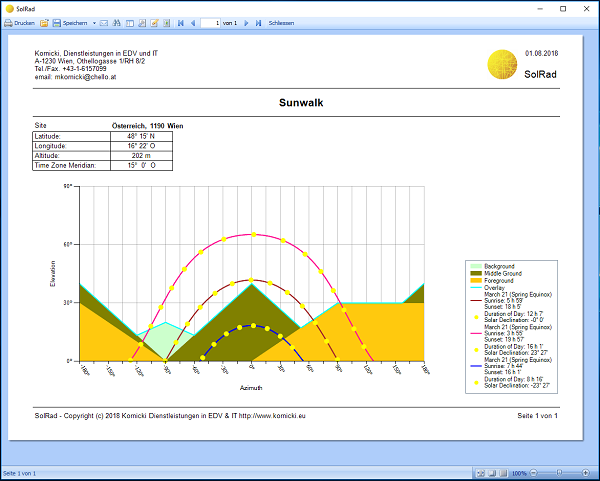 The diurnal variations of the radiations computed by SolRad (global radiations in W/m^2) at the project site can be exported from SolRad for a chosen date and orientation.